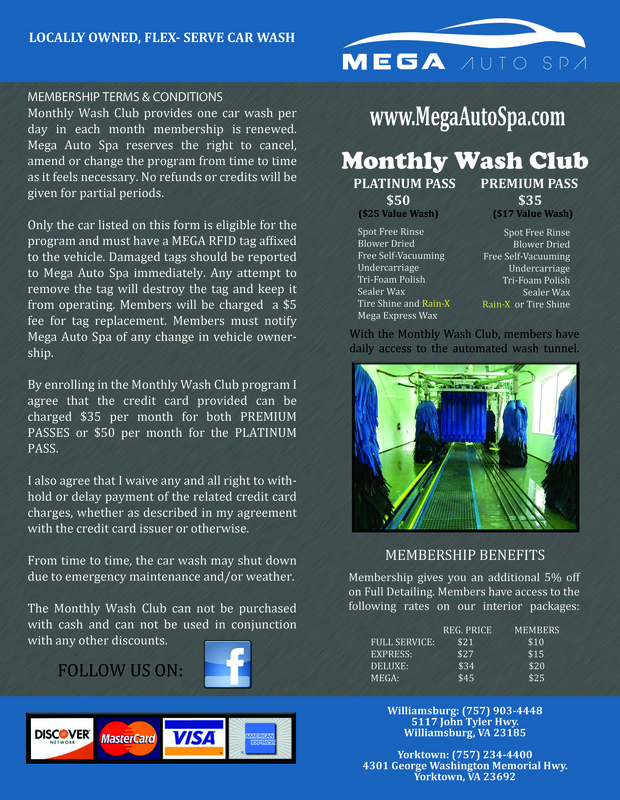 MEGA Auto Spa offers premier services to keep your car shining year round! After you go through the wash tunnel with your vehicle, present your receipt to the first employee you see. Management or a floor lead with fix an RFID tag on your front windshield and answer any questions you may have. At the same time, we will have a signup sheet for you to fill out in order for us to get your account set up. Once you receive the RFID tag and have signed up, we will take care of the rest. Once it comes time to wash your car again, simply drive up to the automatic teller and wait for the teller to read your RFID tag. Once your tag is registered, it will ask you if you want any other services. Once you have made your choice the gate will open and you can redeem your daily wash. Your account will be charged on a monthly basis and you will have access to our facility. You can suspend your membership at any time. Select from one of our great services! In addition to our already incredible prices, try our special Monthly Passes for even more savings! As a locally owned flex serve auto spa, we invested in the best equipment and technology. Copyright © 2017 MEGA Auto Spa, LLC. All rights reserved.